This beautifuly displayed exhibit is a "Must See!" The exhibit ran from October 6, 2002 until September 26, 2004, completing tours in San Antonio, San Diego, Los Angeles, Albuquerque, New Orleans and Winterthur. 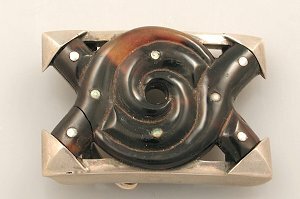 When William Spratling and other silver designers moved to Taxco, Mexico in the late 1920s, they did more than breathe life back into Mexico's dormant silversmithing industry; they revolutionized the art of silvermaking. That revolution is chronicled in Maestros de Plata: William Spratling and the Mexican Silver Renaissance, the premier exhibition of Mexican silver. Curated by Penny Chittim Morrill, one of the world's leading authorities on the subject, and organized by the San Antonio Museum of Art, the exhibition made its national debut at the San Antonio Museum of Art on October 6, 2002. The catalogue that accompanied Maestros de Plata was published by Harry N. Abrams. This major publication on modern Mexican silver includes essays by Penny Morrill and other Mexican history and art authorities on the economics of the silver industry; its cultural and historical context; hallmarking and silversmithing techniques; and the envisioned future for Mexican silver. Contributors include Gobi Stromberg, Helen Delpar, Adriana Williams, Christie Romero, Phyllis Goddard, John Scott, Patrick Kapty, and Jaime Castrejón. Maestros de Plata traces the remarkable changes in Mexican silver design set in motion in the 1930s by William Spratling and his development of the workshop as a setting for creativity. From his workshop emerged talented Mexican silver designers who in turn began their own workshops, many of which continue to create to the pres ent day. The more than 400 objects in the exhibition date from the 1930s to the present, and include not only a wide array of silver jewelry, but also tableware, decorative items, sculpture, and more. 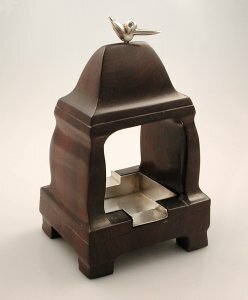 In addition to the approximately 120 Spratling creations are works by more than 20 preeminent silver designers living in Mexico, including the Castillo family of Los Castillo, Héctor Aguilar, Valentín Vidaurreta, Margot de Taxco, Ana Brilanti, Antonio Pineda, Frederick Davis, Jean Puiforcat, Sigi Pineda, Salvador Terán, Matilde Poulat, and Tane. It is with sadness that we announce that Alberto Ulrich died on November 24, 2002. Alberto purchased the Spratling ranch after William Spratling's death, and then formed the company Sucesores de William Spratling that has produced reissues of many of Spratling's designs for more than thirty years. Ulrich's daughter, Violante, is planning to continue producing silver at the ranch in Taxco el Viejo. Penny Morrill wrote the following eulogy that beautifully expresses what so many feel. Life lived to the fullest. Alberto knew both joy and adversity and he confronted each with a positive and powerful energy matched by few. Everything he attempted was on a grand scale: motorcycle racer, deep-sea diver, airplane pilot, art connoisseur, and collector; nothing daunted him. When I consider Alberto's life, what comes to my mind is a verse from Psalm 118, "This is the day which the Lord has made; let us rejoice and be glad in it." A life force within Alberto drew people to him. He engaged them with his wit and conversation. His life experiences gave him the ability to speak with authority on any number of subjects. He loved traveling to new places; and the more exotic and remote these destinations were, the more he relished the adventure of it all. At the center, Alberto was an aesthete, a lover of beauty: beautiful silver objects, paintings, sculpture, architecture, and beautiful women. Alberto chose to live in Mexico, at the Spratling ranch in Taxco-el-Viejo. The ranch house was an assault on the senses, emerging as it did from dense tropical growth. The textures of weathered wood, white-washed walls, and tile floors warming in the sun spoke of invitation. As long as I live, I will never forget the mid-day meals in the open-air dining room, where Alberto was a most gracious host. Alberto was the keeper of the Spratling legacy, and he took it very seriously. The 1987 exhibit at the Centro Cultural/Arte Contemporaneo brought attention to William Spratling as a world-class designer. Alberto spent much time on the meticulous and well-crafted reproductions of Spratling's work and shared with lovers of fine silver jewelry and decorative objects. We can all now count ourselves as fortunate, because of Alberto's unswerving dedication to saving that legacy. We will all miss Alberto, but his absence will be most difficult for his wife, his children, and those who love him. I can only say in consolation, that you think of him as he lived. Recall him at his best, and you will find it impossible to hold back a smile. Even though Alberto is no longer present, his gift to you will be those memories and they will bring peace.